Home :: Onslaught :: Kaboom! Choose any number of target players. For each of those players, reveal cards from the top of your library until you reveal a nonland card. Kaboom! deals damage equal to that card's converted mana cost to that player, then you put the revealed cards on the bottom of your library in any order. 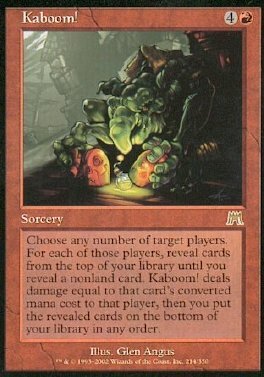 Cards of equal color/cost that Kaboom! Cards of equal cost and different color that Kaboom!